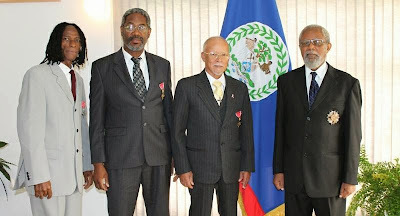 On October 23, 2013 at the Belize House in Belmopan, three Belizean men were appointed to the Most Excellent Order of the British Empire for their outstanding service to their Belizean communities. Frank Alexander Lizama and Colville Ludwig Young Jr., both appointed Order of the British Empire: Mr. Lizama for his contribution to art, education and politics and Mr. Young for his contribution to education and music. Receiving the insignia for Member of the British Empire was singer and musician, Norman Samuel Elburt Hamilton, known throughout Belize as Sam Hamilton, for his contribution to music. The appointments were announced in June 2013 as a part of the Queen’s Birthday Honors.